From “ping me” to “circle back,” there are certainphrases you hear around the office that make many of us cringe. But there are times you catch yourself using them too. While we’re all guilty of using some common office jargon, it might be time to rethink your choice of words. Because, hey -- you don’t want to be that person known for using “LOL” in your emails. 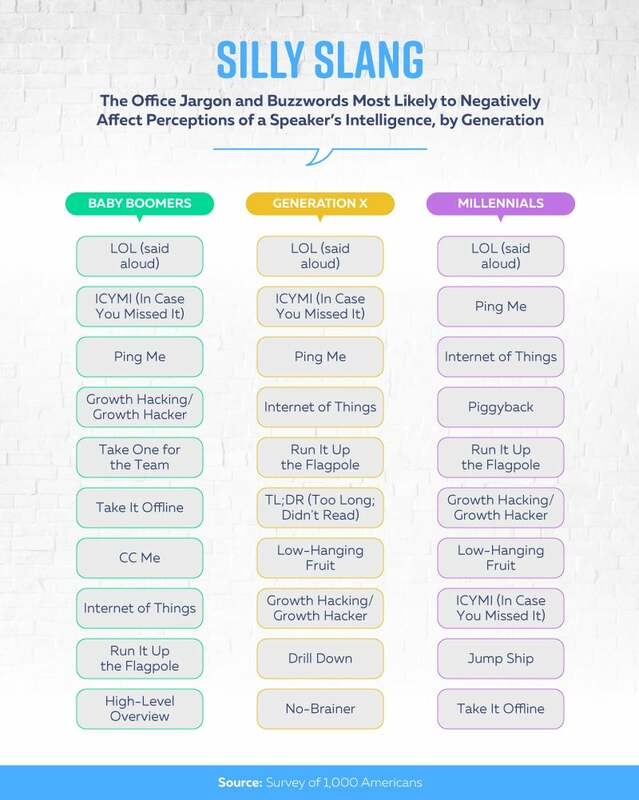 A recent survey by software company Summit Hostinguncovered some of the most cringe-worthy words that people use in the office, with “LOL” (spoken out loud) and “ping me” topping the charts. Of course, it goes beyond just talking. In fact, written office jargon -- whether it’s an email, a slack message or an internal memo -- can be just as bad or worse. 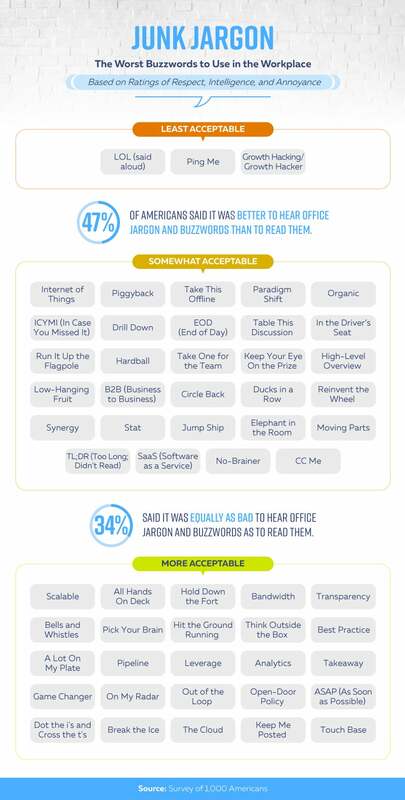 According to the study, nearly half of Americans said it was better to hear office jargon rather than see it written. But 34 percent said it was equally as bad to hear these phrases as it is to see them. Overall, “LOL” (when spoken out loud), “ping me” and “growth hacking” were the top three phrases that people can’t stand to hear. Surprisingly, people don’t mind phrases such as “break the ice,” “on my radar” and “out of the loop.” However, depending on the industry you’re in can also dictate what words and expressions your co-workers find annoying. So, if you’re in advertising and marketing, steer clear of “LOL” and “low hanging fruit.” For people in legal, “internet of things” and “piggyback” are major red areas. Certain generations also have certain preferences when it comes to office communication. Of course, across the board among millennials, gen Xers and baby boomers, "LOL" topped the charts for the least acceptable term. And for the boomers and gen Xers, “ICYMI (in case you missed it)” and “ping me” were major red areas when it comes to corporate jargon. For millennials, “ping me,” “internet of things,” “piggyback” and “run it up the flagpole” were named the most cringe-worthy. The most commonly used expressions around the office that people don't find annoying are “ASAP,” “touch base,” “keep me posted” and “out of the loop.” Sure, it might be time to cut back on the “ping me’s” or the “circle back’s,” but the likelihood that using them will severely hurt your career is probably slim. In fact, only 16 percent of Americans said they believed using office jargon could be harmful to their careers.